Tailornova is a patent-pending online fashion design software that helps you create unlimited designs easier and faster than ever. Visualize your creations in 3D and get custom-fitted patterns in seconds. Design a complete fashion collection in minutes. From sketches to 3D samples to patterns, instant smart fashion design templates allow you to create original designs with a single click in seconds. They allow previewing 3D garment samples, flat sketches and made-to-measure sewing patterns, ready to download, cut and sew. It all begins with a body and your measurements. 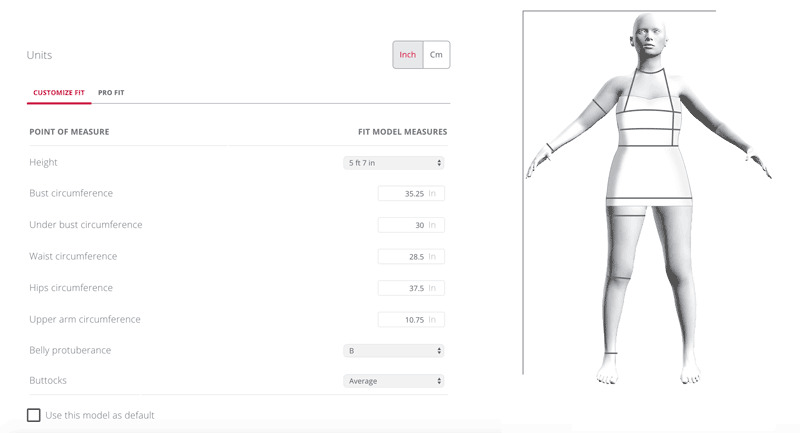 You can customize your own true-to-life 3D FitModel™ тo replicate any figure, measurements, height, and a body shape. Customizing the 3D FitModel™ will allow automatic creation and customization of unlimited designs and Made-To-Measure patterns in seconds, effortlessly and with precision. - laser cut for sewing bots. Or import patterns into CAD. OMG!!! I wanted to send a love letter to say how much I love this platform. Being an indie curvy designer this is awesome and affordable and helps me design my collections. Thank you. I admit I was a bit worried that your site may be too advanced for beginners like me, but I was wrong, it is in-fact ideal, and the service I have received is second to none. Many thanks, see you soon for more patterns. You guys ROCK! I found place that will print my patterns for me, and won’t kill my budget. My niece is thrilled, we are both in heaven, can't wait to get started. I love your design app, and that I can upload my fabric swatches. I show pic of them to my niece and it's helping us decide on fabric choices. I can't tell you how much finding your site has meant to me. Thank you so very very much. The design tool for the custom fit patterns is fabulous, all the possibilities! I was looking for a sheath dress pattern with princess seams, sewn from a sweater knit... Impossible to find - and I am so excited that the design tool made it possible for me! I was very happy with the promptness of service and the instructions for printing and assembling the pattern were very good. The sewing instructions were very complete, and even tho I have sewn from many years I learned a new way to install the fly zipper on jeans. And best of all, they fit! Perfect! The first time with no alterations! Happy Dance! I will certainly continue to subscribe again.